Autumn is one of the most interesting seasons to me. You come full force out of long summer nights filled with carefree wonder and rolled down windows, and suddenly the freedom collapses and you are piled under leaves and pumpkin spice lattes. It’s a beautiful shift, but it can also be cold, dark, and uncertain. Colors change, days seem shorter, and responsibilities soon return. I do enjoy this time of year, but as we all know, to everything there is a season. As you stand there by the bonfire, apple cider in hand, disembarking from another hayride, remember that change is not always a bad thing. Thanksgiving is a very special time of the year that lands itself in this season. Families gather around tables with each other and share stories smothered in turkey and pumpkin pie. There is coolness in the air and warmth in the hearts of so many. I’m not sure if it’s the filters or the food, but everyone just appears to be so much happier around holidays. We have a tradition our family tries to uphold each Thanksgiving. Before we eat until our stomachs hurt, we go around the room and name at least one thing we are thankful to have in our lives. The list ranges from a wonderful family to good health all the way down to a little one’s favorite toy. We have so many reasons to be thankful because of all the many blessings God has bestowed upon us. Even in all the joy that surrounds us during this time, I know firsthand how painful and dark these season changes can be. During those pivotal life transformations, we change too. Sometimes God gives us exactly what we want to prove to us it isn’t what we necessarily need. Just recently I accepted a job I thought was perfect. I begged God for it. I rearranged schedules and neglected certain priorities in order to make sure I reached this goal. I had my long-term career “plan” beginning to fall into place. As time went by I started to realize that forcing God’s hand is never a good way to go through life. I was missing church, neglecting responsibilities, and was weighed down with all the wrong things. As I drove home from that job one day, stressed and overwhelmed, the phrase “be thankful for what you don’t have” kept playing over and over in my mind. I sat there confused. What does that even mean? All my life I have been reminded to give thanks and praise to the God who gives good gifts, but what about the things He takes away or keeps from me? Think about it. If you don’t have a sickness in your body, you have something to be thankful for. If you don’t have to walk miles to school and you don’t walk around without shoes, thank Him. If you don’t have to live on the streets and you don’t have to beg for food, thank Him. We too often take for granted the things other people wish they had. We are a blessed people in what He gives us and what He keeps us from. What about those times we pray and plead and His answer is not what we want? The times when we try our absolute hardest and seemingly come up empty. The times we think our desires should be met, but they don’t align with His, so we get angry. I replayed prayers God had answered for me over the years and thought about how gracious and kind He is to give me so many good things, yet it was that phrase “be thankful for what you don’t have” that caused me reevaluate my outlook. There is an old country song that simply states, “Sometimes God’s greatest gifts are unanswered prayers.” While I do not agree that God doesn’t answer our prayers, I do believe that His answers are often silent or may even be a resounding “no.” To our finite minds, this is unfair. We blame God because He didn’t give us that job. He let a grandparent die, or He let the person you loved and wanted to marry someday walk out. How could a gracious and loving God say no or let this happen? I don’t claim to have all the answers, but one thing I have learned is that God knows just what He is doing. Sometimes His best yes is in His well-thought-out no. “For my thoughts are not your thoughts, neither are your ways my ways, declares the Lord. For as the heavens are higher than the earth, so are my ways higher than your ways and my thoughts than your thoughts” (Isaiah 55:8-9). If God lets someone walk out of your life; if you don’t get that job or promotion; or you get your heart broken and you feel alone; thank Him. If your car breaks down or you don’t get elected as student body president and no one understands you, thank Him. If He takes things away from you, your parents get divorced, a loved one gets sick, or you don’t get that college acceptance letter you worked so hard for, don’t fight Him. Thank Him. You may not understand, but thank Him. He has a better yes prepared for you and a bigger plan than our eyes can see. Recall how blessed you are in this brand new way. In this season of Thanksgiving and pecan pie, take a look back and remember what He has blessed you with, but I admonish you this holiday and every day, thank Him for what He didn’t let into your life. And thank Him for the things He has taken away. Be thankful for what you don’t have this year because in that you will begin to understand how thoughtful God truly is in what He gives, what He withholds, and what He takes away. “In everything give thanks: for this is the will of God in Christ Jesus concerning you” (I Thessalonians 5:18). Rachel Skirvin is a lover of travel, nachos and the gospel. She is a graduate of Urshan College and will most likely always call it Gateway. 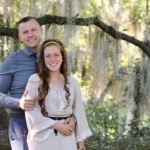 She just recently married her best friend and together they are serving at the Pentecostals of Cooper City in South Florida.